Left to right: Pamela Abshire, Nathan Siwak, President Mote, Natalie Salaets, Reza Ghodssi. 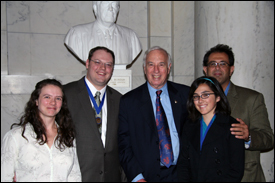 Two students working with ECE/ISR faculty were honored with 2009 Achievement Rewards for College Scientists (ARCS) Fellowships at a U.S. Supreme Court reception on Oct. 8. Nathan Siwak is a graduate student advised by ISR Director and Herbert Rabin Distinguished Professor Reza Ghodssi (ECE/ISR). His fellowship comes as a result of his work on homeland security chemical sensing applications using indium phosphide MEMS optical switches. His project is the fully monolithic integration of active and passive optical components onto a single chip chemical sensor platform, specifically through developing on-chip semiconductor optical sources. Natalie Salaets, a senior electrical engineering undergraduate student working with Associate Professor Pamela Abshire (ECE/ISR), was presented with an ARCS Fellowship for her work within the University of Maryland’s Gemstone program. She is helping to create an improved, interactive rehabilitation training system for post-stroke patients. Her team is designing a miniaturized software and hardware system that can decompose and classify EMG signals from particular muscles in the human body used for walking. This is Natalie’s second ARCS award. Three other University of Maryland students also were honored with ARCS Fellowships at the reception. Brendan Casey, a Ph.D. candidate in Bioengineering, received a fellowship for his work in developing a “smart” polymeric material to control critical hemorrhaging. Biochemistry Ph.D. candidate Seth Thomas won for work in macromolecular crystallography of cellular proliferation processes, important to cancer research. Stefanie Sherrill, a Chemistry Ph.D. candidate, was honored for her work in developing multilayered electrical energy storage nanodevices. The students met Associate Justice Anthony Kennedy and were joined at the reception by their advisors and University of Maryland President C.D. “Dan” Mote. ARCS fellowships offers student recipients a renewable award of $15K per year and are sponsored by the Metropolitan Washington Chapter of the ARCS (Achievement Rewards for College Scientists) Foundation, Inc. ARCS provides science, medicine and engineering scholarships to outstanding students who are U.S. citizens, contributing to the advancement of science and technology. Sen. Ted Kauffman (Del.) delivered a speech recognizing the ARCS winners on the Senate floor on Oct. 22.